Micromax launched another tablet in its Funbook series, Dubbed as Funbook Talk. Micromax Funbook Talk comes offers built-in GPRS support and voice-calling, you don’t need external 3G USB cards to access internet. Funbook Talk has 1 GHz processor, 512 MB of RAM, 7-inch capacitive touch screen with 800×480 resolution, VGA Front facing 0.3 MP Camera and it runs on Android 4.0 Ice Cream Sandwich. Funbook talk comes with 4 GB of Internal memory and support up to 32 GB of microSD. Funbook talk designed specially for Indian students and tablet comes preloaded with Study material for all primary to under-graduate levels, Sample paper for Engineering, Medical and MBA exams and Interactive video classes. 2800 mAh Battery gives 112 hrs. of stand by time and 5 hrs. of talk time. It also support 3G Dongle via USB 2.0. 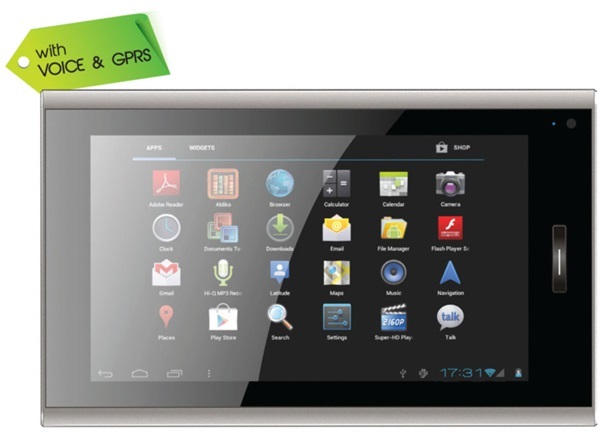 The Micromax Funbook talk available in Slate grey and comes with the price tag of Rs. 7249 ($139). You can buy the tablet from Saholic for Rs. 7199.